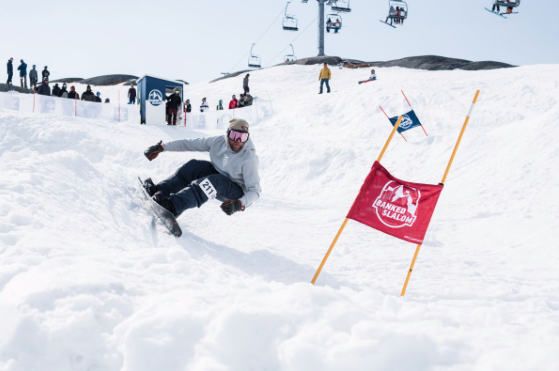 The Riksgränsen Banked Slalom is just around the corner, due to take place on May 16-18, 2019. This year they have added a kids category into the mix, as well as aiming to get at least 150 women competing and after last years cancellation for the Norgesvängen session, they are hoping to reclaim the day. With only a couple of weeks to go for the seventh edition of the Riksgränsen Banked Slalom, we have some really good news to share with you! So make sure to sign up and be a part of a weekend of filled with good snowboarding and high fives! Last year we had over 120 female riders in the competition! We’re hoping to go for 150 this year, but we need your help! So bring your friends and tell them to come along! Last year we planned a session in Norgesvängen, but we had to cancel it due to bad weather. We’re hoping we can get sweet revenge on it this year. That’s just one of the fun things we’re planning for this years happening. Stay tuned for more fun news! We’ve added a Kids category, so they will race in a group of riders between 4-12 years old. This means that the Juniors is 13-17!